My daughter was 12 on the outside, inside she is an old soul. She wanted to go to Yoga, and in the little town of Worland, there was only one teacher available. She used a room that was actually Chelsea’s old preschool room. So it was a double treat for us to re-visit the past and then learn this new (to us) form of exercise. We didn’t have yoga mats, and there was no place in town to buy one. So I made make-shift mats out of non-slip cupboard liner, a beach towel, and duct tape. When we got there the extreme earthly beauty of a teacher, Erin said she had some mats for us to use, but I figured we were ‘ok’. And I kept my socks on, because I thought I’d be ‘ok’. Chelsea at 12 was very flexible and bendy like most little girls that age, and nailing the poses were nothing to her. My downward facing dogs on the other hand continued to slide apart, and my form …. what was that? When it was over I couldn’t believe an hour had flashed by. The last pose, savasana…wow, what an awesome way to finish a class. We first put our legs up a wall with our butts resting up against the floor and the wall, and relaxed. Then after a few minutes of that, we stretched out and laid flat on the floor. It was amazing how comfortable the hard floor felt underneath me. And how I felt accomplished for going to a class to satisfy my daughters whim, that turned into an incredible fulfilling action for me. Erin snuck over and placed eye-pillows on all of our eyes, and I melted. Or did I lift off the floor? A feeling hard to describe. When the class rolled over to their right side, we all sat up and put our hands together in prayer position, and Erin thanked us for coming and bowed reverently to us. Everyone said ‘Namaste’ and I didn’t know what it meant, but boy was it peaceful in there. Everyone got up and commented on their body and how great it felt, how tough certain poses were for some, but overall the general feeling in the room was a unified relaxation. A lot of comments were sent Chelsea’s way for being so flexible, and she blushed, but was encouraged to want to come again. I hadn’t worked out in a group setting in a long time. I used to love a Step Aerobic class I went to at one time. But I decided I would work out at home to a video and save myself the drive, and not have to worry about what my body looked like in a classroom of others. Yeah – that didn’t last. I didn’t have anyone to commit to, not even myself – I was only cheating me. The people in that class were not judgmental at all. Only complimentary. We were a unified group at the end. We were all different ages, shapes and sizes, but now unified, and in a relaxed and peaceful state, and knowing of honoring our body with movement. Another hard to describe feeling. Skip ahead 4 years and now I am a teacher of yoga. I think back to that sweet moment I had in the little preschool room with my daughter. 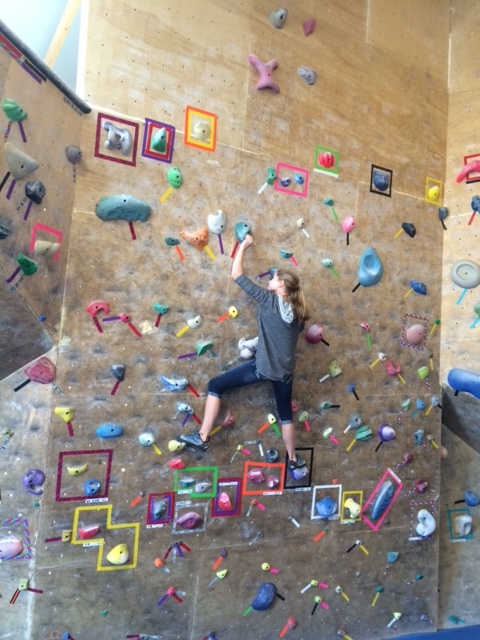 Last weekend Chelsea and I took a climbing and restorative yoga workshop together in Lander. I don’t get to be the student much in class anymore, even though I am constantly learning and trying to perfect my form. It was nourishing to do yoga with her again, both of us as students. I encourage you to either try yoga, or think back to your first yoga practice, and honor yourself. 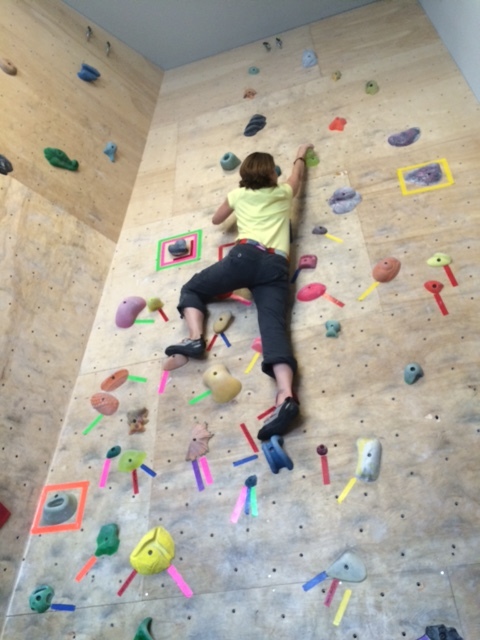 Here I am at 46, trying ‘bouldering’ gym mountain climbing. Thanks to my daughter for wanting to try something new, and I love to follow her lead.